For the love of (seriously, good) food! 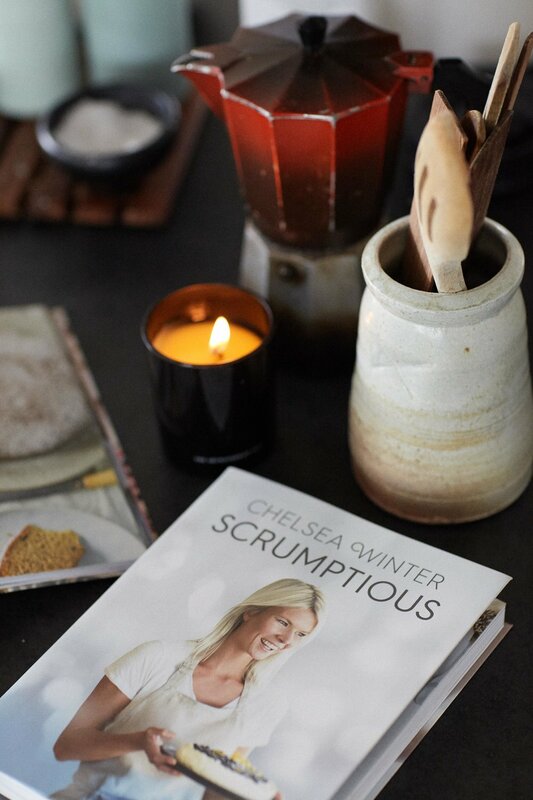 chelsea winter talks about her new cook-book, beauty routine and her go-to recipes. The role-juggling entrepreneur, who oscillates between producing home-cooking recipes for her award-winning cookbook series and her role as a celebrity chef, is also one of New Zealander’s most influential people. Naturally, her Instagram following is more than 36,000 followers—yet another string to her multi-faceted life. Her following has a lot to do with her genuine and honest approach to food (and life in general). Her delicious recipes are based on ingredients that can be easily found in any local supermarkets anywhere in the world. Foodies all over the world were first introduced to Chelsea when she won MasterChef New Zealand in 2012. Her cooking style is all about homemade goodness and SCRUMPTIOUS surprises! (Just the way we like it.) Here is our interview with Chelsea as we talk about career, beauty, skincare, and of course, food. "I grew up in the countryside—in the Waikato—and later in the north-west of Auckland in Kumeu. I was and always will be a nature girl; always off up a tree or jumping in the creek or picking up the chooks or building a tree hut or driving the tractor. Simple things have made me happy. My mum is a very good cook. She had a massive veggie garden, and we enjoyed our own free range eggs and beef most of the time. I think mum helped me develop a healthy relationship with food early on. I was never afraid of butter, good quality bread, bacon, pasta, and a bit of cream here and there. It's all about finding a happy balance—everything in moderation! And homemade food cooked from scratch is such a beautiful thing. The more people I can teach about it, the better! Without even realising it, I learned to cook just by helping her. She was amazing, as she just let me do my own thing and experience what I needed to in the kitchen and in life in general. She reckons I used to be in the cupboards putting veggies in pots and 'cooking' up a storm from a young age—perhaps three or four years old. Till this day, she has been supportive." Can you share a little something about the process involved in producing a cook-book? "I can only speak about my process. I'm sure everyone is different, but mine is organic. I cook what I like, and in a style that I think is achievable by using ingredients that are readily available for home cooks at the supermarket. There are about 90 recipes in a book, and by the time it's broken down into the different sections, and then the different proteins, etc., it's not that daunting at all. I write my recipes from scratch, using a blank word document at home in my office. Then I just go to the kitchen and get cooking. The original recipe will often be quite different to the one I first wrote because when I'm cooking, that's where the real inspiration happens. I end up testing each recipe at least three times. It's a nice process." "My parents (and my two step-parents) have been my biggest role models. And also my siblings who are 10 years older than me. I have an awesome family. To be honest, I don't 'follow' anyone; I kind of enjoy marching to the beat of my own drum. I think there are amazing chefs out there doing inspiring things, so don't get me wrong. But I'm not a chef. I'm self-taught, and I think my strength lies in writing recipes. There's an art to it, and it's not as straightforward as you might think. So it's always really lovely to hear people say how they find my recipes achievable even though they aren't confident in the kitchen. I like making people look good when they serve up my recipes. Mission accomplished!" "I'm really low key. Low fuss, low stress, easy going and that is for all facets of my life. So I'm not going to get all prissy and do a posh table setting. Maybe I'll jam a big vase of herbs on the table, or some nice flowers (my mother-in-law grows beautiful flowers and is always bringing a fresh bunch around). I love natural wood surfaces, nice organic fabrics, and ceramics. I have some beautiful handmade pottery plates, bowls and cups made on Great Barrier Island and I just adore them. Simple is best, and no one does simple better than nature!" "I'm pretty low-maintenance when it comes to beauty. Normally just a bit of cleanser, moisturiser, then foundation. I do love my mascara. I'll usually exfoliate once a week if I remember. Sometimes, if I'm really feeling saucy, I'll paint my toenails, but I kinda feel it's like making a silk purse out of a sow's ear. I have cook's hands too, so they get hammered daily and are pretty wrinkly and wrecked. A good natural hand cream is a must for me before bed." "I keep it simple. I wear my own clothes and do my own make-up for shoots. I figure I might as well be myself, otherwise who else am I trying to be?" "I don't wear perfume, and neither does Mike. I just like the scent of his skin and he is the same. No point masking it :)"
"Just a good shampoo and conditioner. And being a blonde, on days I can't be bothered washing my hair, a sprinkling of cornflour mussed into the roots does the trick beautifully. It is a good tip for travel, too and cheaper than dry shampoo sprays." "All I do to keep fit is walk the dog once or twice a day and do yoga. And in summer, loads of bodysurfing, bodyboarding, and now actual surfing, too! I live in the water in summer—and on it, if I'm fishing. I dance around quite a bit in the kitchen, too—very good for the soul." "Always be true to yourself. Follow your heart, follow your gut. Don't always make decisions based on money because it won’t lead you down the path of happiness. Do what makes you happy as often as you can. Cook well, eat well, love well. Sing!" "For a while it was buffalo wings with blue cheese sauce from my first book (At My Table). People go bananas over that stuff. - It's crazy and the ultimate crowd pleaser, and that blue cheese sauce is to die for. I tend to just cook what I feel like most of the time. I don't really have a favourite, although a good roast chicken is always on the cards. I have an awesome method for cooking a roast chook in my new book, Scrumptious." WANT TO HEAR MORE ABOUT INSPIRING CAREERS AND BEAUTY ROUTINES ?